Exhibition catalogue, Rufino Tamayo: Painting, Drawing and Graphic Work, 1925-1989, Moscow, Soviet Painters Union, 1989, no. 77, p. 118. Exhibition catalogue, Rufino Tamayo: Painting, Drawing and Graphic Work, 1925-1989, Oslo, Edvar Munch Museet, 1989, no. 79, p. 86 (illustrated). Exhibition catalogue, Rufino Tamayo: Painting, Drawing and Graphic Work, 1925-1989, St. Petersburg, The Hermitage, 1990, no. 77, p. 118 (illustrated). Exhibition catalogue, Rufino Tamayo: Painting, Drawing and Graphic Work, 1925-1989, Berlin, Staatliche Kunsthalle, 1990, no. 149, p. 313. Exhibition catalogue, Rufino Tamayo: Recent Paintings, 1980-1990, New York, Marlborough Gallery, 1990, no. 28, p. 67 (illustrated in color), p. 61. UNAM, Rufino Tamayo: Imagen y obra escogida, Mexico City, 1991, no. 10. O. Paz, J. Lassaigne, Rufino Tamayo, Mexico City, Ediciones Polígrafa, 1994, no. 276, p. 317, (illustrated in color), pp. 299. Exhibition catalogue, Tamayo: Su idea del hombre, Mexico City, Instituto Nacional de Bellas Artes, Museo de Arte Contemporáneo, 1999, no. 56, p. 93 (illustrated in color), p. 90. T. Del Conde, Tamayo, Mexico City, Grupo Bital, Américo Arte Editores, p. 115 (illustrated in color). Moscow, Soviet Painters Union Main Hall, Rufino Tamayo: Painting, Drawing and Graphic Work, 1925-1989, August - October 1989. This exhibition later traveled to Oslo, Edvar Munch Museet, October - January 1990; St. Petersburg, The Hermitage, February - March 1990; Berlin, Staatliche Kunsthalle, May - June 1990. New York, Marlborough Gallery, Rufino Tamayo: Recent Paintings, 1980-1990, September - October 1990. Mexico City, Instituto Nacional de Bellas Artes, Museo de Arte Contemporáneo Internacional Rufino Tamayo, Tamayo: Su idea del hombre, August - October, 1999. In 1989 the year he painted Hombre guiñando un ojo (Man Winking), Tamayo celebrated his ninetieth birthday, but presumably, continued to work eight hours each day in his studio as he did all his life. In November of that same year, he would undergo open-heart surgery and shortly thereafter paint his last work (El muchacho del violín [The Boy with a Violin]). (1) Though painted at the end of his life, Hombre guiñando un ojo exemplifies the universal humanism, abstract figuration, and modernist aesthetics that preoccupied the Mexican master throughout his long, international career. As his international fame increased, Tamayo became preoccupied with his legacy at home. For the last three decades of his life, he was often at the center of aesthetic and political debates within Mexican culture regarding the role of nationalism within the visual arts. His universal abstract figuration and the lack of overt politics in his work had always distinguished him from los tres grandes and garnered him more lasting attention abroad. By the 1940s, however, he felt increasing pressure to assert his Mexicanness as tensions mounted between the discourses of "arte puro" and "arte politico." In the midst of these disputes, as the cultural elite and government officials debated the status and nature of Mexico's national, post-Revolutionary culture, Tamayo became involved in two major projects that established him as a "newsworthy patriarch" within the Mexican cultural milieu of the 1970s and 1980s(5): the donation of his pre-Hispanic collection to Oaxaca as the Museo de Arte Prehispanico de Mexico Rufino Tamayo and his collection of international modern and contemporary art as the Museo Tamayo Arte Contemporáneo in Mexico City. Tamayo was born in Oaxaca, Mexico, to parents of Zapotec Indian heritage, and therefore it is often assumed that he had a deep understanding of Indian culture. Mexican-based artist Jean Charlot explained, "Tamayo is one of the few who can validly claim as his the picturesque subject matter of tropical Mexico. "(6) In other words, Tamayo's ethnicity legitimized his native vision. Art historian Mary Coffey has revealed how Tamayo condemned the politically disingenuous and paternalistic nationalism inherent in the paintings of indigenous subjects on some of Mexico City's walls, whereby the post-Revolutionary elite had reconstituted the Indian as timeless and pure. (7) For Tamayo, his ethnicity was never marshaled for the sake of a political program, but instead to tap a so-called authentic, indigenous point of view or spirit that would enable him to explore pure plastic elements of painting. Distinct from the Mexican School's portrayal of indigenous life, Tamayo's evocation of native sources came through at the level of formal manipulation and affinity with folk and pre-Columbian art. His ethnicity, then, distinguished him from most fellow Mexican artists and also granted him special status in the international avant-garde, where currents of primitivism held sway. He adapted his style to accommodate modernist concerns and pictorial values, while still keeping his "Mexicanness" in tact. (8) Although after the 1930s his works rarely illustrate specific indigenous or native content, they continued to reveal his deep commitment to the abstracted figure based on the fusion of pre-Columbian and modernist forms. The figure is always grounded in reality, but as Mexican writer, poet, and diplomat Octavio Paz famously stated, Tamayo's late modern painting embodies the "timelessness of myth." 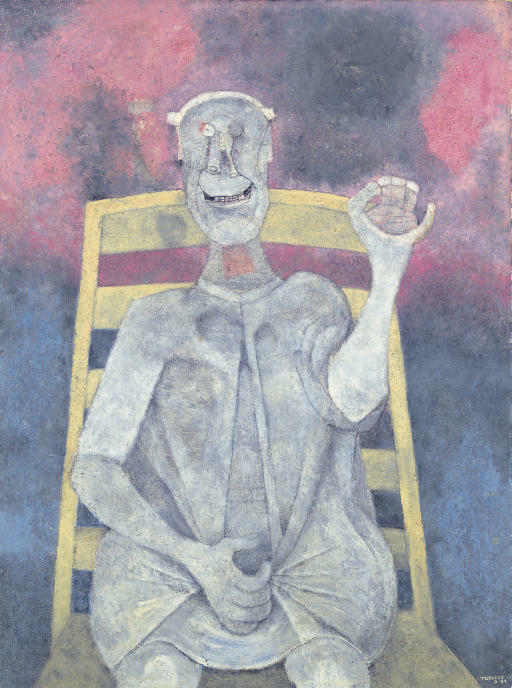 Hombre guiñando un ojo, like many of Tamayo's late works, depicts a male figure in a direct, frontal pose facing the viewer, grinning, and gesticulating. The man is seated on a simple, modern, ladder back chair, which supports him, anchors the composition, and serves as an armature for the painting. Draped in a tunic that opens in the front and ends at the bent knees, the figure clutches the open robe with his right hand, and raises his other hand in an odd gesture, a benign wave or salutation. The forefinger and thumb meet, the fingers are clutched, and the pinky is held out, suggesting the figure is making a hand signal--a secret language, a code, or perhaps just a colloquial gesture. As is customary with the artist's repertoire of solitary figures, the background is empty, but radiates a diaphanous sprinkling of colors--shades of grey, purple, blue, and the famous Tamayo pinks. A circular patch of color hovers above indicating a shadowy sun or moon. 1) Suckaer, "Chronology," in Tamayo: A Modern Icon Reinterpreted, exh. cat., ed. D. C. du Pont, California: Santa Barbara Museum of Art, 2007, p. 426. 2) The biographical information in this paragraph is condensed from A. Indych-López, "'None of Those Little Donkeys for Me': Tamayo, Cultural Prestige, and Perceptions of Modern Mexican Art in the United States," in Tamayo: A Modern Icon Reinterpreted, p. 343-365. 3) He was able to do this as a result of meeting the critic Walter Pach through his friend the writer Octavio Barreda. See I. Suckaer, Rufino Tamayo: Aproximaciones, Mexico City, Editorial Praxis, 2000, p. 92. 4) A. Valdés Peza, "Cuándo y Dónde," El Universal (Mexico City), August 18, 1959; Radar, "Llegó Tamayo," Exélsior, Mexico City, December 28, 1960. Cited in Suckaer, "Chronology," p. 422. 5) O. Debroise, "Reaching out to the Audience: Tamayo and the Debate on Modernism," in Tamayo: A Modern Icon Reinterpreted, p. 380. 6) J. Charlot, "Rufino Tamayo," in An Artist on Art: Collected Essays of Jean Charlot, 2 vols., Honolulu, University Press of Hawaii, 1972, p. 357. 7) Mary Coffey, "'I'm not the Fourth Great One': Tamayo and Mexican Muralism," in Tamayo: A Modern Icon Reinterpreted, p. 250. 8) A. Indych-López, "'None of Those Little Donkeys for Me,'" p. 345-47. 9) Paz, "Poesía, pintura, música, etcétera: conversación con Manuel Ulacia," Vuelta 155, October 1989. Cited in Debroise, "Reaching out to the Audience," p. 386. Debroise is referring to the notions of timelessness and historical continuity in Tamayo's works. 10) J. Corredor-Matheos, Tamayo, Mexico, Ediciones Polígrafa, p. 27.